You may not believe in ghosts, but you cannot deny terror. A group is introduced to the supernatural through a 90-year-old New England haunted house. Be prepared for hair-raising results in this classic horror film! 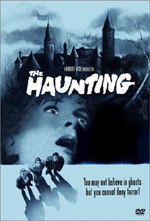 With the DVD release of 1963’s The Haunting, one must wonder what took the folks at Warner Bros. so long. Shouldn’t this sucker have hit the shelves back in 1999 when the Jan de Bont remake brought more attention to the property? Whatever the reason behind the delay may be, the original version finally is here. I saw the remake and was one of about six people who kind of liked it. The flick didn’t knock me out, but I thought it was more entertaining than many indicated. The original presents a very similar tale, though changes do occur. 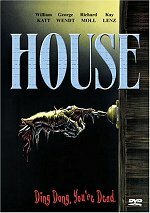 The film starts with the dark history of the Hill House. Built by Hugh Crain in the 19th century, we learn of how it allegedly came to be haunted. Eventually a woman named Mrs. Sannerson (Fay Compton) inherits the house, and Dr. John Markway (Richard Johnson) wants to use it for psychic research. She agrees but establishes that her nephew Luke (Russ Tamblyn) – who hopes to get his greedy mitts on the sprawling manse before long – must be there for the studies. We then encounter Eleanor “Nell” Lance (Julie Harris), a meek and mousy woman who spent the last decade or so caring for her ill mother. With the old lady now deceased, Nell wants to start to live her own life, but her controlling sister (Diane Clare) – with whose family Nell lives – stands in her way. Nell goes off for the stint at Hill House anyway, and gets there before anyone else. Nell meets Mr. and Mrs. Dudley (Valentine Dyall and Rosalie Crutchley), the caretakers. Mrs. Dudley obliquely warns Nell of the house’s dangers as she establishes some rules. Before long, the other study participant arrives. A stylish socialite with apparently strong ESP abilities, Theodora (Claire Bloom) takes an instant interest in Nell that goes beyond platonic friendship. Dr. Markway soon shows up as well, and the trio tours the spooky house. When Luke comes on board, they ensconce themselves in the building and get to know each other. Some sexual tension develops: Theo clearly is interested in Nell, but Luke has the hots for Theo. Dr. Markway and Nell seem drawn to each other as well, but the former is married, which Nell doesn’t find out until later. During their first night in the house, Nell and Theo undergo a ghostly “attack” that mostly conjures up a lot of noise. The men got drawn away and didn’t hear any of this racket. From there the movie explores what happens to the residents as they get pulled deeper and deeper into the building’s creepiness and try to establish what’s really happening. Eventually Markway’s wife Grace (Lois Maxwell) comes onto the scene as well, which heats up matters to a degree. That latter introduction provides probably the movie’s weakest point. Grace arrives at Hill House very late in the game and exists literally as nothing more than a plot device. She then plays much too influential a role in the proceedings. Grace is there for no reason other than to move along the story in a certain direction, but it doesn’t need her to go that way. In one of the few improvements displayed by the 1999 Haunting, it dispensed with the Grace character. The only other significantly stronger aspect of the de Bont edition comes from its audio. I’ll discuss this DVD’s sound quality more fully later in the review, but the 1999 Haunting offered one of the all-time great mixes, especially in its DTS incarnation. It’s not an exaggeration to say that when de Bont’s movie works, it does so due to the terrific sound design. Since the 1963 Haunting shows us nothing and also uses audio to a heavy degree, it loses much of that impact. I didn’t expect the sound of a 40-year-old flick to live up to that from a recent offering, but the somewhat toothless audio found with this movie hampers it somewhat. Still, the rest of the flick works well enough to make it significantly stronger than the 1999 take. This occurs mainly for two reasons. First, the multiple Oscar-winning Robert Wise is a much better director than de Bont. The latter can pull off some good action scenes but not much else, whereas Wise could do it all. His Haunting is a much tighter and better-paced flick, and it seems considerably spookier. The other improvement found here stems from the fact that Wise makes The Haunting a more subtle experience. The de Bont version doesn’t allow much room for interpretation; it shows us so many supernatural events that we’re left with nowhere to go other than believe that the house is haunted. Wise, on the other hand, doesn’t spell things out in that manner. Do ghosts reside in Hill House or is these events all in the imaginations of the participants? Wise doesn’t tell, and since most of the movie comes from the perspective of the seemingly mentally unstable Nell, the questions become even more prominent. This ambiguity works well for the flick, as it keeps us guessing. Interestingly, one area in which Wise’s Haunting is less subtle than de Bont’s stems from Theo’s intentions. No, she never comes out and tells Nell she wants her, but it’s pretty darned clear from her behavior. In the de Bont take, we get more ambiguous hints from the Theo character. The Wise version seems superior in that regard, if just because it more prominently plays up the sexual tension among all the participants and makes it a real factor in the flick. Just as I think the de Bont Haunting is better than its detractors would have you believe, I also feel the Wise Haunting isn’t as great as its champions claim. However, the latter does provide the superior movie without question. It suffers from a few minor flaws but it generally comes across as creepy and effective. If we could combine the positives of both versions, we’d have a tremendous scary movie. 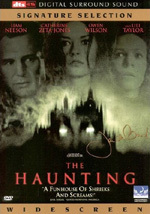 The Haunting appears in an aspect ratio of approximately 2.35:1 on this single-sided, double-layered DVD; the image has been enhanced for 16X9 televisions. Much of The Haunting provided solid visuals, but enough problems popped up along the way to knock down my grade to a “B-“. Sharpness appeared positive. The movie consistently seemed nicely detailed and distinct. No issues connected to softness or fuzziness showed up throughout the film. Jagged edges didn’t cause concerns, but I noticed a bit of shimmering – mostly related to Markway’s tweed jacket – and some light edge enhancement at times. Black levels looked very good throughout the movie. Dark tones came across as deep and tight, and shadow detail also was solid. Low-light scenes appeared concise and well defined. Contrast also seemed strong, as the movie exhibited the appropriate balance between light and dark. The Haunting lost most of its points from a fairly typical source for an older movie: source flaws. Grain crept into low-light shots a little more heavily than I’d expect, but that didn’t seem like much of a problem. On the other hand, a mix of specks, spots, grit, marks, blotches, and streaks showed up periodically throughout the flick. I also noticed a few jumps and one or two thin vertical lines. The defects didn’t run continuously through the movie, and they mostly appeared reasonably modest, but they did cause a few distractions. Overall, though, the image remained good enough to merit a “B-“. The monaural soundtrack of The Haunting seemed decidedly ordinary. Speech was somewhat flat but always remained acceptably clear and intelligible. The lines came across as a little too dull to be natural, but they presented no discernible problems. Effects seemed clean and failed to display distortion or other issues, but they also lacked much range, as they appeared a little thin and feeble. The louder scenes didn’t sound especially powerful, which unfortunately sapped some of the movie’s energy. Music appeared listenable but favored the treble elements and didn’t come across as particularly dynamic or rich. The audio always stayed clear, but the lack of much range made The Haunting a very average track for its era. This DVD release of The Haunting packs a few extras. We open with an audio commentary from director Robert Wise, screenwriter Nelson Gidding, and actors Julie Harris, Claire Bloom, Richard Johnson, and Russ Tamblyn. All of them were recorded separately. Wise provided a running, screen-specific piece, while the others’ interviews were interjected amidst his statements. The commentary presents some good material, though it seems spotty at times. No one particularly dominates, though we hear the most from Wise and Johnson, and the two women scarcely appear. The information covers a mix of topics. We get some notes about the original novel and its adaptation, Wise’s working methods, the actors’ approaches to their roles and the project, and general notes about this and other flicks. A fair amount of anecdotal material pops up along the way, and it’s cool to hear about subjects like Harris’ standoffish behavior on the set. Unfortunately, the track goes dead more frequently than one might expect from a piece with so many participants, and too many of the statements appear tangential. I usually enjoy comments about related projects or film in general, but here those notes come across as filler to a moderate degree. Still, the commentary appears fairly informative and interesting as a whole. The Stills Gallery includes two components. The “Photo Gallery” presents 38 images. It mixes publicity materials, alternate titles for the film, and both various snapshots. “Director Robert Wise’s Original Screenplay” fills 50 stillframe screens with exactly what the title describes. We see parts of the script marked up with Wise’s notes. It’s a very cool document to get. Things That Go Bump In the Night offers a short and superficial text essay about the history of ghost movies. Cast & Crew simply lists a few participants; no biographies or filmographies appear there. Finally, the movie’s theatrical trailer shows up with monaural audio and an anamorphically enhanced 2.35:1 aspect ratio. A generally eerie and intriguing flick, The Haunting doesn’t quite seem like one of the all-time greats, but it works nicely overall. The movie benefits from tight pacing and a nice ambiguity that keeps us on the edge of our seats. The DVD presents generally good picture with average audio and a small roster of extras highlighted by a fairly interesting audio commentary. 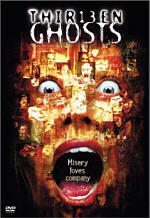 Neither the movie nor the DVD bowled me over, but both seem good, so I give The Haunting my recommendation.